This cafe has been on my list for awhile now that I finally got the chance to try it. 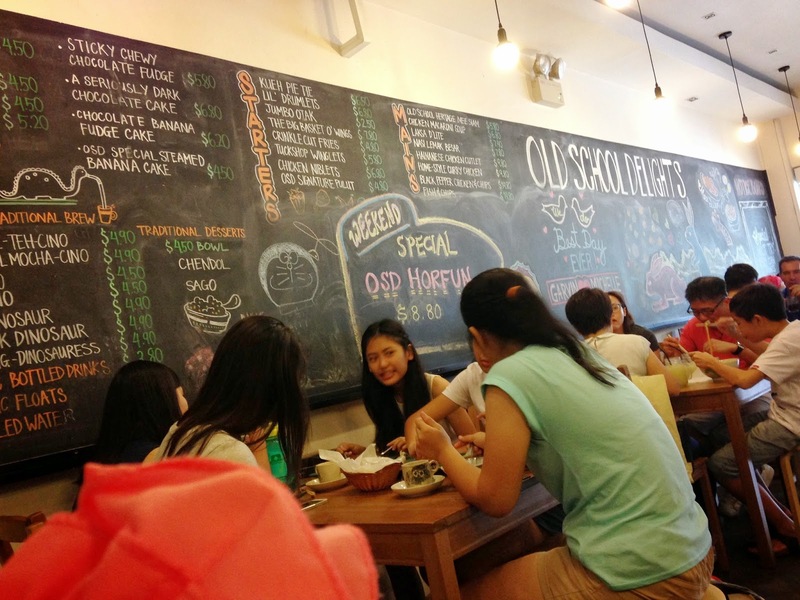 Down at Duxton there's actually quite a bit of cafes that you can check out. 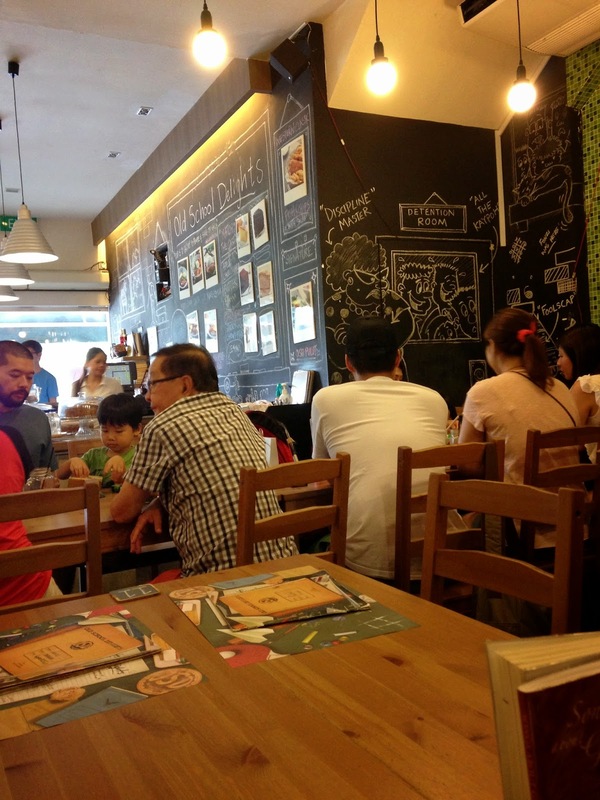 One that I've been to would be Department Of Caffeine which is located at 15 Duxton Road. Just slightly further down from where group therapy is. As we couldn't reserve, I made it to Group Therapy first and waited for the rest to come. They do have a policy that if everyone in the group hasn't arrive, they can't release the seat to you. Good to know this point though. I had a waiting area for me to wait and browse the menu and decide what I wanted. Group Therapy isn't very big, probably 35-45 seater? Just my wild guess. Big groups like 8-10 would have a problem cause from what I saw, there was only 1 long table with high chairs good for big groups. So what happened... I was meeting 3 other dining companions and all of them were late. 2 were caught in a jam and 1 ended work late. So 2 of us waited for the other 2 that was caught up in the jam for bout 30 minutes. Because my friend wanted to order some drinks first he asked if we could have the table while waiting for our friend. The rule was, "no full group, can't have seats" but the waitress offered us an alternative. She said, "I can give you this table (pointing to the table that can fit 5 guest) first while waiting for your friend, but if there's a 2pax customer that comes along, we will place them beside you. When your friend arrive, we will re-arrange for a 4 pax seater for you." She did not outright reject and stick to her rules. She gave us an option, and told us about it clearly. Throughout she had been polite and nice. Which I really don't think she needed to go to that extend because why? Group therapy was really packed and people were willing to wait, just like us. Oh, and guess what, they don't charge service fee. Good service? Definitely, and it deserves to be mentioned. Good job there! They are located on level 2, and there's not major banners on the ground floor. So keep a lookout for a grass patch and black door! And you're be greeted by this the moment you open the doors! Wasn't too bad, edible and pretty filling. Looks like a small portion? I almost couldn't finish it and man, it was reallyyyyyyyyyy good. You have to order this if you love poached eggs with salmon and hollandaise sauce. Really. ORDER. Lol. I'm not a fan of sunnyside ups but it was good according. Of course it's almost mandatory to finish a meal with desserts nowadays. And here we have a waffle for 4 of us to share because we're too full for 2 to share 1. They don't have alot of flavours of ice cream but the waffles was light, crispy and fragrant. A good waffle to satisfy your dessert portion of the meal. It's pretty easy to get to group therapy via Tanjong Pagar MRT station, and you take the Exit A. After you exit, you turn right, walk straight until you can see Orchid Hotel (super long queue for the Tonkatsu king which I've also been wanting to try..), walk past that tonkatsu king and you'd see a traffic light, cross it and turn right, then continue on until you see Duxton Road side and turn right and walk straight all the way. It would be on the right handside of the row of shophouses when you're facing them. It's roughly about 10 minutes walk down. Haven't tried? Time to give it a try! Do you have an EXIT PLAN to escape? There's really a couple of them and some themes are pretty interesting. You can choose from those harmless looking once to those scary vampire/undead themes. Ever since it came to Singapore, I've been wanting to try them out for myself! But... paying $28 per person.. I'm not too sure if I'd enjoy or not. If you're like me, (cheapo and yet want to give it a try of this concept of reality game room...) then you can visit Exitplan! Exit plan cost you only $15 on a weekday and $18 on a weekend! That's almost $10 lesser then $28 and the location is so near Duxton that the $10 you saved could fund you on a waffle (with some top ups). We were not allowed to bring any bags/cameras/phones beyond some point and it had to be locked away. Oh yes, we went on a Sunday night and mind you, the booking was pretty full. Lucky for us we managed to grab a small room for 4. It's always good to check out their website and check for their booking availability.... here. Always book in advance, or check to avoid disappointment! Getting to Exitplan is pretty easy. We parked at Oriental Plaza, which is just beside exitplan and since it was after 5pm, it was just a flat rate per entry charge of $2.14. If the doors' locked, there's a passcode for you to key in which is 4242! This is their little signage! Happy climbing to level 3 and you'd not miss the door. Really. See what I mean? How to miss a door like this. Lol. We stepped in was greeted by their staff in the exitplan tees and the entire room was filled with photographs and more photographs of people who had played way before us. So many people, like really alot. Lol. So we were briefed on some basics and to know before being brought to our rooms. So here's my review after spending a painful 50 minutes locked in the harmless looking room. Since there was 4 of us, they recommended Focus Pocus (a poker theme) game room for us. They have Friends of Eriden (I took a peep and this room looks absolutely like a child's room. Totally harmless) and The Cursed Chamber (which is the scarier themed one). When we first went in the room, we were like... Okay. So where do we start? An introductory video was played, and then it becomes a countdown timer of 50 minutes game time. We saw a few locks (not revealing how many else I will be spoiling the fun) and that was it. No clue, nothing. No where to start. It's just you and your brains to work it out how to go about unlocking yourself. Suddenly I felt like I was in the movie Saw because they also woke up not knowing what happened to them. hahahahhahahaha. When we finally unlocked the first one, we took a peep at the timer and we were surprised to find that 20 minutes have passed. Never in our wildest dream to think that a harmless looking room could make us crack our brains so hard that 20 minutes passed in a blink of an eye! After unlocking the first one, we got stucked again. Meeeeeeeeeh. 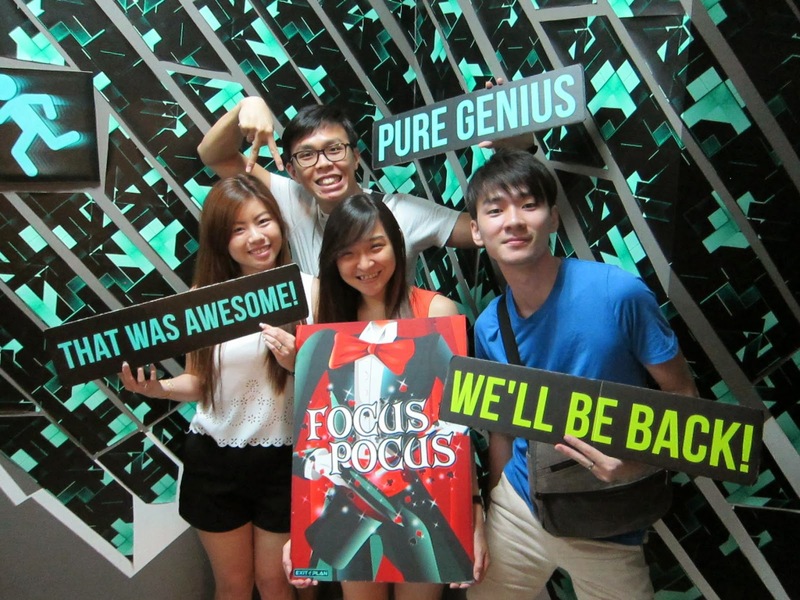 So we seek some clues and help from the staff (which is like some lifeline that you can either use once or multiple times until you shiok but you can't compete on the hall of fame) and managed to continue on. Though we didn't manage to escape the room successfully, but we really enjoyed ourselves in the entire process of unlocking and solving. Not only we had to work like a team, we had to help and trust each other that we'd solve the puzzles/quiz/mysterious correctly when we spilt up the 'work'. This game definitely requires some 默契 (mo qi which means understanding of each other well) to complete and escape. If you doubt your members, then time will be wasted trying to correct each other. We took turns to take the lead too. Focus Pocus is conducted in a pretty small room. Nothing too physical that you have to jump/climb/shift items. It's really down to your brains cracking those harmless looking mystery. The creators of Exitplan definitely have put in great efforts in creating these mysteries. If you're someone who loves to solve mysteries/quizzes/puzzles, you should definitely come here. Escaping need not always be a physical thing, for a change, use some creative brain juices and feel smart after solving them! Here, is a picture of us taken at Exitplan! I'm definitely heading back there to escape the next room which is Friends of Eriden (which according to the crew that's the most difficult room). See, you can't judge its book by it's cover, trust me the room looks just like a child's room. Nothing too tough looking. Never did I expect that's the hardest. Meanwhile... I will be heading to try another reality game room by another company soon. I will give you my thoughts about it once I'm done with that. The other one is rather.. I am assuming to be more physical and scary. I'm looking forward and I hope it's as good as exitplan. If you and your bunch of friends ran out of activities to do, well, now you have something to do. Book a room at exitplan together and solve away! 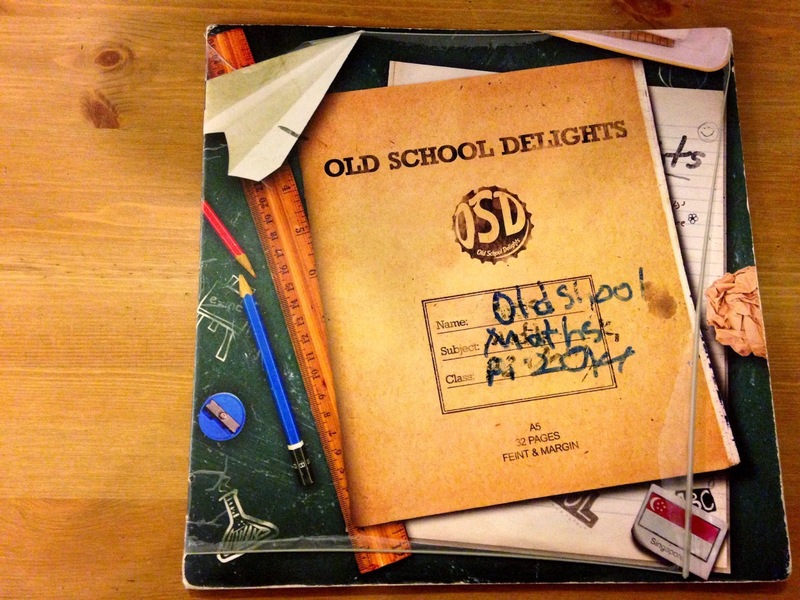 Cafe: Old School Delights brings you back to school! I remember those days back in school when the bell rings everyone gets ready to race to the canteen to queue up for food. Some would 'chope' seats at the benches by putting their bottles etc. I kinda miss those benches and long tables in the canteen that so many of us just squeeze together in one table and gobble down our lunches together like a big family. Miss that feeling? Fret not! 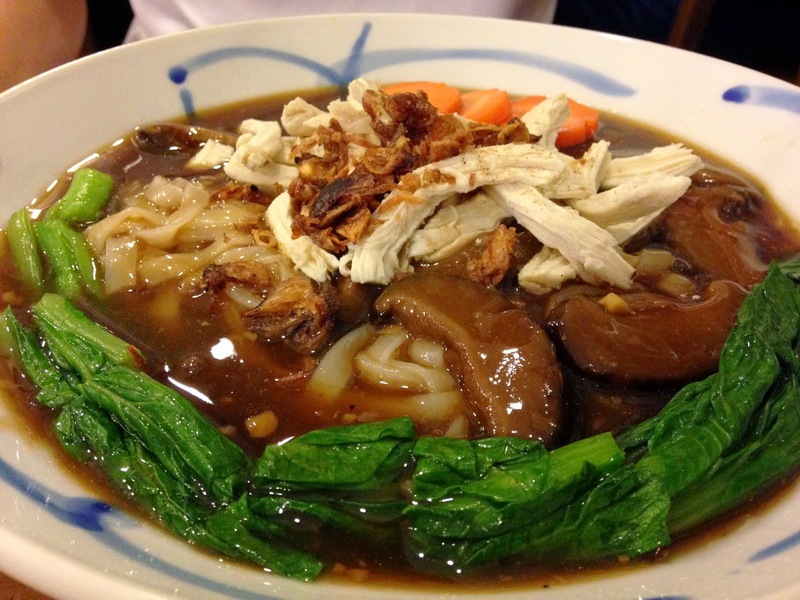 There's this new Old School Delights opened right at Upper Thomson Road. I wanted to make reservations but they didn't allow reservations for 2pax (only for more than 6 pax). But lucky for us, we managed to grab some seats on a Sunday afternoon. Well, we have to share the table with someone else but hey, it's alright! That made it even feel more like canteen style cause... there's always this chance that the long bench is shared by different people. //PS: Pardon for the quality of photos cause.. I forgot to bring my camera, again. This really brought back memories. The design of this menu is pretty creative. 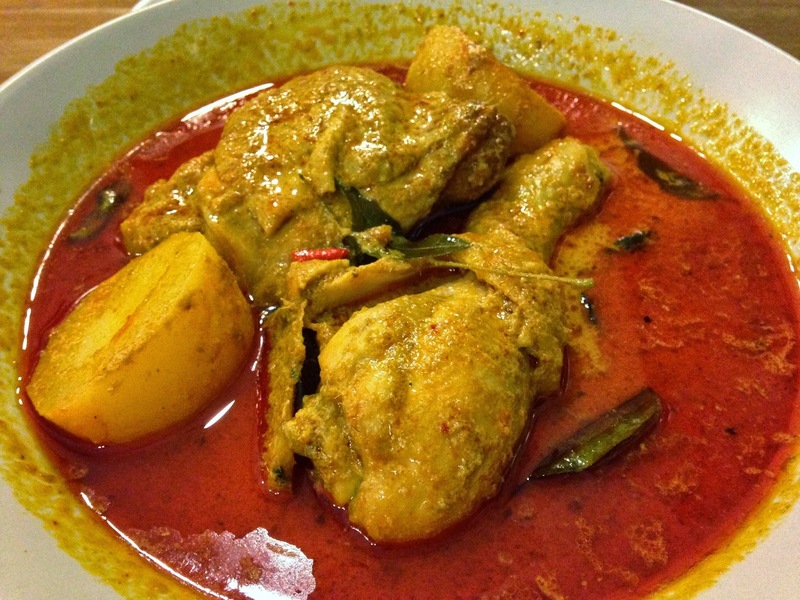 The menu consist of local delights like Laksa, Hor Fun, Nasi Lemak and Curry Chicken etc. A good range of sides and beverages too. 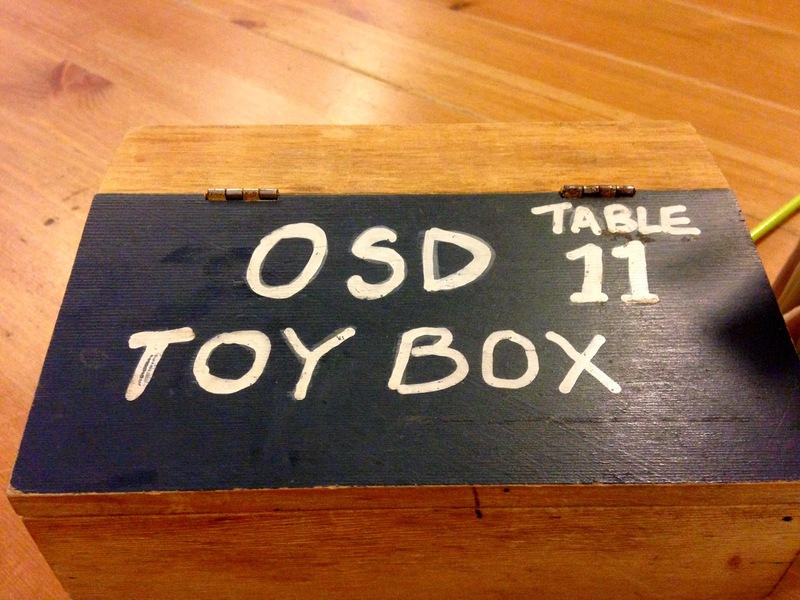 You're given a board and a marker to write your own orders before handling it over to them. So here's what we have ordered. Ta-dah! Old school games! Everything inside this box is totally my era. I've played the stones, the rubber (I know it was pretty much a boy's game but I liked it too). 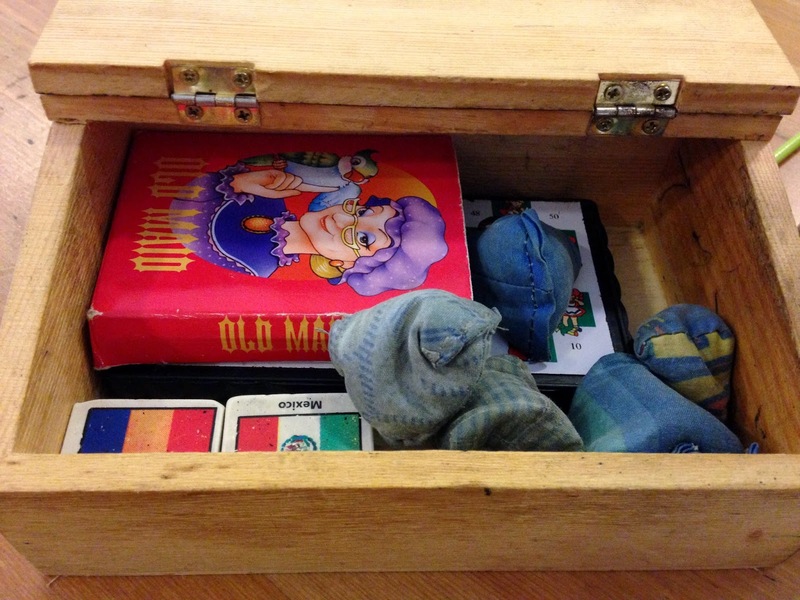 Old maid is definitely a girls' must know and snake and ladder is just idiot proof. Well I guess if you're bored while waiting, have a game or so! But let me tell you, the food was served so quickly that.. I think it came within 10 minutes. It made me wonder if they even did cook the food! Everything up till before the food was served, was good. After the food came, I was terribly disappointed. First, the rice was hard. Dry and, you know what's coming. I don't like it. 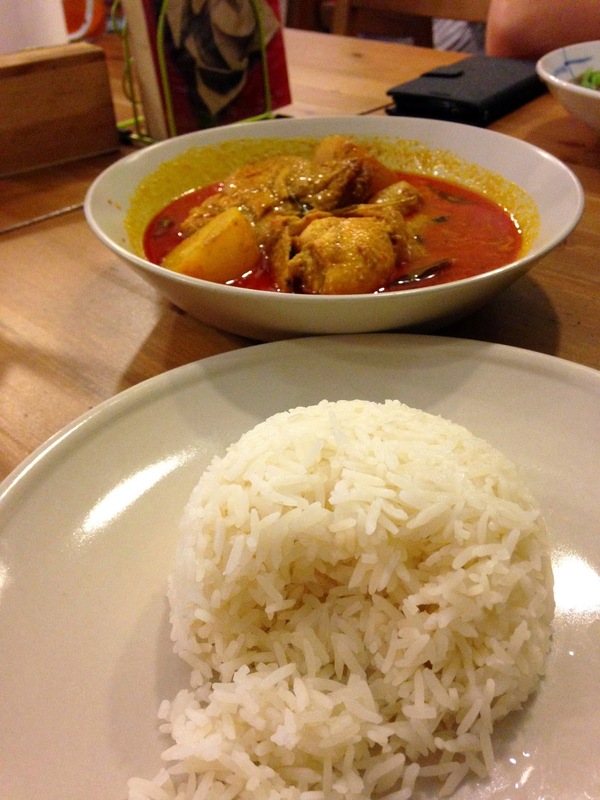 Second, the curry was... so oily and I tell you, toast box currry chicken wins this hands down. And c'mon, toast box is even cheaper then this? Totally not worth it. The chicken was alright, but sorry everything just got screwed up by the curry. Of course, I didn't finish it. Not the curry, nor the chicken, neither the rice. My take? Skip this, really. Ah, I don't even want to explain how this taste, just skip this too. This to me was kinda just normal, my dining companion managed to finish it up though. 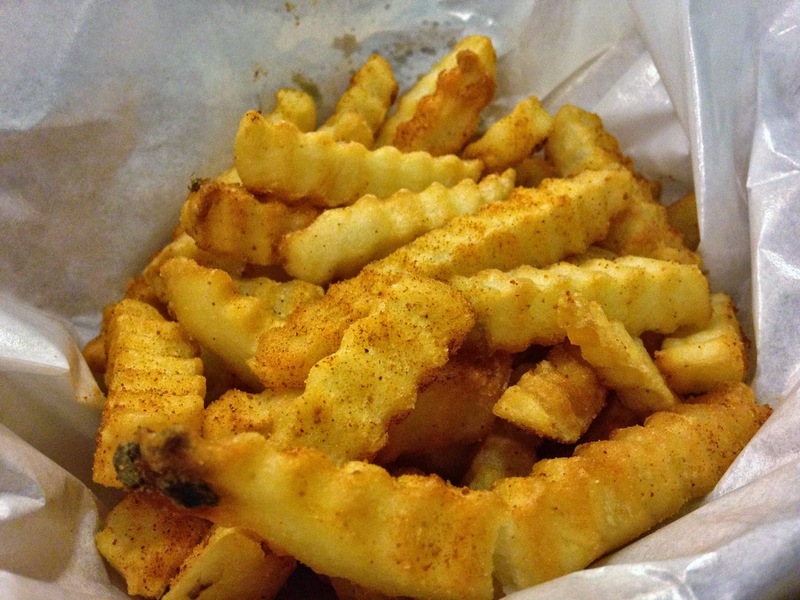 Of course the fries was decent, this can't go wrong. Maybe you'd like it but it wasn't the kind of sticky chewy chocolate I was expecting? 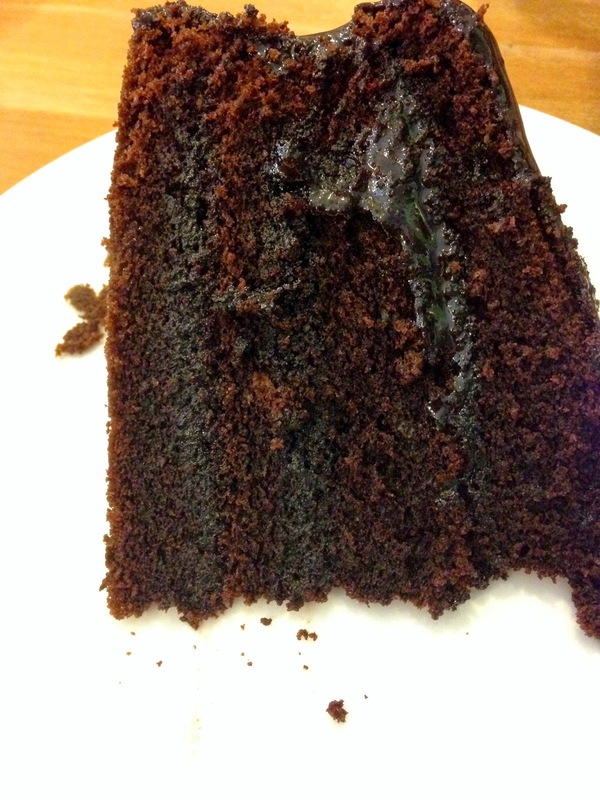 The cake was tad too dry and it tasted a little saltish? I don't know but no, this is not a good chocolate, and definitely not worth to try. This, is really a good place with great ambiance to relieve the school/childhood feel. If you're particular about food, no this is not the place for you. Sorry but once is enough even though the price is decent. I had 2 drinks, 1 side, 2 mains and a dessert for $42. I'd rather spend this somewhere else though. Meh, OSD you disappointed me. 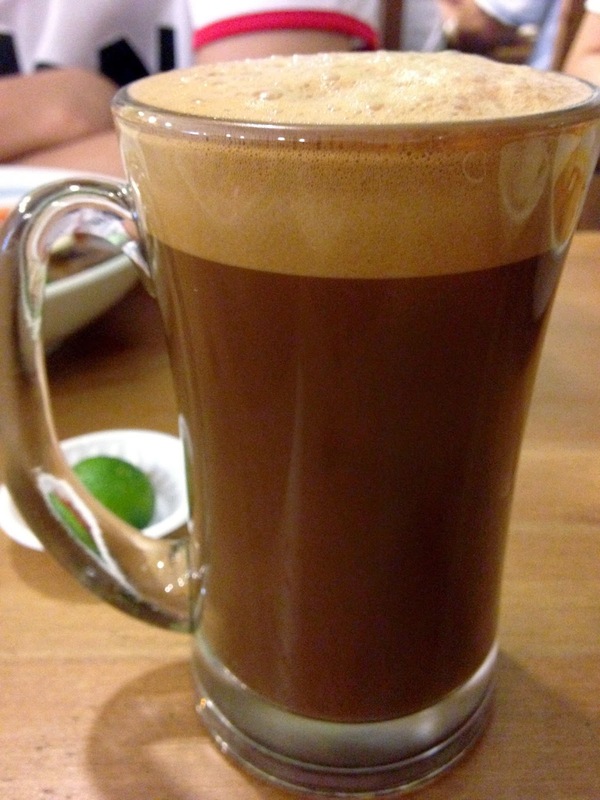 Reservations with Au Chocolat has been made easy with Chope! Have you tried reserving with Chope before? I really like it because I prefer the hassle-free booking system. Anything but calling. Sometimes it frustrates me a little when the person on the other line either can't get my name.. or maybe I have to repeat 5 times my phone number etc. Having the peaceful convenient of no waiting time and just a few clicks on the mouse and keying a few details and... tadah! Reserved. Chope sends you reminder on the day itself as well and not to mention reservation confirm emails will be sent to you. Though no SMS notification but... Cmon, who doesnt use a smartphone these days. It's so easy to access your emails on the go. 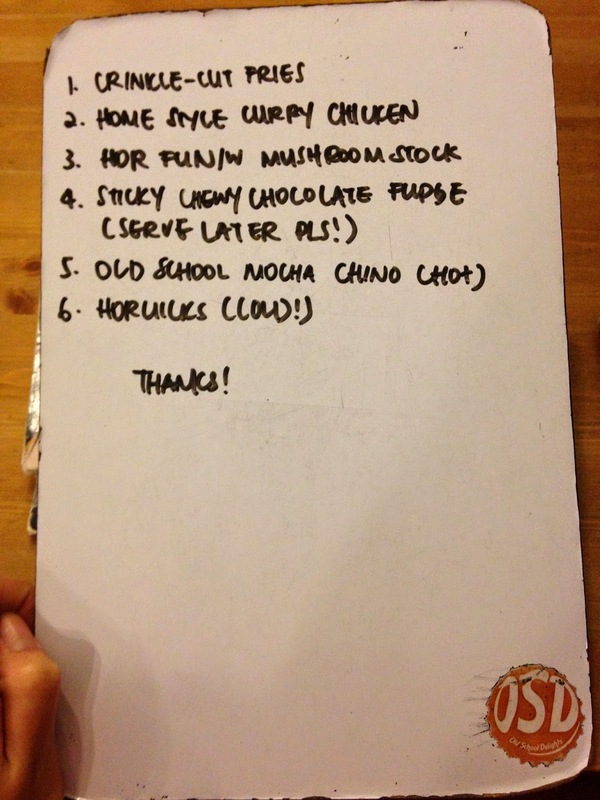 Enough of chope, here's what we had for the night. 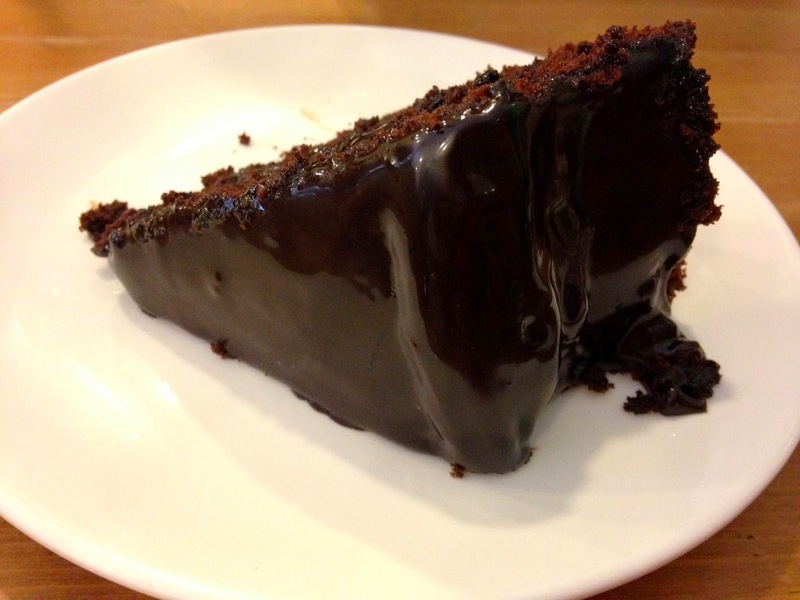 Au Chocolat isn't new to most but still, I'd show you what we had and hopefully it helps you to decide if it's worth the money. Portions are generous and so are the prices. There were 5 of us and the bill choke up to almost $250. This is another of those (to me) more expensive places that I would only dine for special occasions. This time, it was a birthday celebration for one of my dining companions. We went on a Monday, the entire Au Chocolat was almost empty. I guess it's pretty normal for a weekday night. For your convenience, here's their online menu at a glance. And it's good because they show you the price too. So you don't get a shock of your life when you're there. Don't forget to factor your 10% and 7% GST in. I am not a fan of steak cut fries. But my dining companions enjoyed it quite abit. Especially the BBQ sauce. Always my choice for salad, it never goes wrong. When it came I was... Whoa. How come my dish so funny looking. Well, I had to take it off layer by layer to eat. The pancake wasn't good, bacon was alright. The sauce was pretty decent. Didn't like the beef cause of the 'beefy' taste. Poached eggs were acceptable. Just the pancakes, rather disappointing. Pretty average all-day breakfast which makes it slightly disappointing for the price you have to pay. I thought this was pretty decent. Though slightly on the high side for such a portion, it was barely enough for my friend. Lucky for him, we shared ours with him. Hahahaha. The eggs are really awesome. Really, you could taste the difference of scramble eggs from this to the king's breakfast. If you love scramble eggs, this is definitely for you. This is a May special so I guess it's probably off the menu now. It's pretty decent but the portion was barely enough for my friend. Well, we had a bit of sharing here and there so everyone had a good fair share of food. By the time we finished the fries, the salad and all our mains... We were all bursting. But of course we're not giving dessert a miss! Honestly, all 5 of us had difficulty finishing this. We were too full to begin with, and this was very very sweet. But it's nice, if you love super sweet chocolates. Oh, all my dining companion for the night was growing boys, so you can totally imagine the portions. I've came here before so this is a re-visit. Food is good with great ambiance that's worth to come once in awhile for special occasions like this.